Zimbabwe National Liberation War Veterans Association (ZNLWVA) chaiperson Ambassador Christopher Mutsvangwa says he is back to full fitness and is ready to lead the ex-liberation fighters, especially at a time when the country is under threat from elements that want to destabilise it. The firebrand war veteran’s leader also dismissed a Twitter account that is purportedly posting messages in his name. In an interview with The Sunday Mail yesterday, Ambassador Mutsvangwa said he suspects that fugitive Professor Jonathan Moyo, who of late has been on a frenetic anti-Government crusade, is behind the fake micro-blogging account. “That account is definitely not mine; they are imposting and often abusing my name. ‘‘I have seen the account and I want to dismiss it as fake. They are trying by all means possible to soil my name. I suspect its Jonathan Moyo and the usual G40 suspects,” he said. Mischievous characters, he added, took advantage of his ill-health to try and drive a wedge between him and his fellow comrades. ZNLWVA secretary-general Victor Matemadanda said the reported fallout between him and the chairperson of the war veterans body was being engineered by “remnants of G40 that are still within our party”. 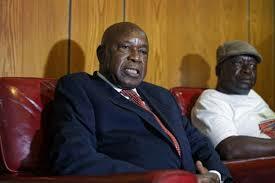 “Cde Mutsvangwa and I are comrades in arms. I am happy that he is now back in office and he is fully fit. When he was away receiving treatment, there were some people that attempted to put a wedge between us by suggesting that I want to topple him as chairperson. There is no truth to that because I have never harboured such intentions,” he said. He said Cde Mutsvangwa is one of the few cadres with the history of successfully upending and debunking opposition media falsehoods. Cde Matemadanda, who is also the Deputy Minister of Defence and War Veterans Affairs, said the ex-combatants are more united than ever, especially in the wake of the recent disturbances.